· Physiological, or primary deterioration. This often begins within 24 hours after harvest and is characterised by blue or brown discolouration of the vascular bundles of the roots, called "vascular streaking". There are indications that this primary deterioration is due to wound responses comparable to those observed in other plant storage organs. · Microbial or secondary deterioration. Usually occurs 5-7 days after harvest and involves a wide spectrum of fungi and bacteria which develop in the flesh, causing a variety of wet and dry rots. Cassava roots must be harvested and handled with extreme care if they are to be kept for more than a week. There are a number of different practices which, if used in combination, will assist in delaying deterioration. · Cutting off the stems, leaving only a short part above ground. This operation should be done about three weeks prior to harvesting. · As cassava roots usually start rotting from the neck, (i.e. the point of attachment of the root to the parent plant), harvesting the roots with part of the stem (2-5 cm) still attached may prevent a rapid spread of decay into the root. · Minimize damage at lifting by harvesting while the soil is wet, for example after a rain. · Retain only those roots that do not show signs of injury. Roots that are to be kept for more that one week or more should be carefully selected since curing will not be effective on roots with extensive damage. · Establish curing of the roots after harvest as a routine operation with, as far as possible, the minimum of handling. The problems of storing fresh cassava roots has led to the traditional practice amongst subsistence farmers of leaving the roots in the ground until they are needed and, once harvested, to consume or process the roots immediately into a more durable form. This practice does have a number of disadvantages. The most important is that large areas of land are occupied by a crop that is already mature and is not available for further cropping. The longer roots remain in the ground the more they become fibrous and woody and their starch content decreases. It is also considered that their susceptibility to loss is increased while the mature roots are still in the ground. · keeping small quantities of cassava in water. All these practices are simply attempts to limit moisture loss from the tubers but at best they can extend the storage life of the tubers by only few days. During the last twenty years there have been some developments in improving storage methods capable of extending the shelf life of fresh cassava roots by at least two weeks. These, amongst other advantages, make it possible to market the crop further afield and give an increased margin to the opportunity of holding stocks of fresh cassava, even for few days, at a processing plant. A joint project between the Natural Resources Institute, and Centro Internacional de Agricultura Tropical studied alternative storage methods to the traditional re-burial procedures (Crentsil et al. 1995). These included storage in pits, in field clamps and in boxes with moist sawdust. All the storage methods investigated favoured curing conditions in a high humidity and high temperature environment in order to slow down the rates of physiological and microbiological deterioration. However, to be successful they all require careful harvesting and selection of the roots prior to storage, since curing is not effective if root damage is extensive. Storage was successful in field clamps, similar to those used for potato storage, for up to eight weeks. The clamp consists of a layer of straw laid on a dry floor covered by a heap of 300-500 kg of roots followed by a layer of straw and a final layer of soil. Openings were left at the bottom of the heap to provide some ventilation. This storage method was found to be difficult to manage where seasonal variations in climate made it difficult to either limit or increase ventilation and, during a wet season, to ensure that the floor of the clamp remained dry. It also had a high labour requirement. The method involves putting alternate layers of sawdust and cassava roots, starting and finishing with a layer of sawdust. As an alternative to sawdust, wood shavings, peat or any other suitable packing material can be used. However, the packing material must be moist but not wet. Physiological deterioration occurred if the material was too dry and microbial decay accelerated when it was too wet. In Uganda this storage method is being tested in combination with the lining of the box with plastic (Nahdy and Odong, 1995). The study indicated that 75% of the roots remained acceptable after four weeks in store, provided the roots were packed immediately on the day of harvest. With a delay of only one day only 50% of the roots were rated as acceptable. This technique has been used for some export markets but the higher transport cost involved because of the box containers has precluded its use for domestic market. This appears to be the most practical and promising method of storing cassava roots intended for the urban markets. A number of studies have shown that cassava roots treated with an appropriate fungicide and kept in an airtight plastic bag or a plastic film wrap can be stored for two to three weeks. At present thiabendazole, which is widely used to treat potatoes, is the safest and most appropriate fungicide to be used. Most of the chemical remains in the thick peel of the root. Only 1 mg/kg of residue was found in the parenchymal tissue, which is substantially below the limit of 5 mg/kg set for potato (Cooke et al. 1988a). The method was developed by CIAT. It involves the dipping of cassava roots in a 0.4% w/w solution of thiabendazole for 10 seconds and storing in plastic bags. It has been successfully tested in Ghana (Crentsil et al. 1995) where it was found that household bleach (0.95% active chlorine) was as effective as thiabendazole if sound cassava roots were not stored for much longer that seven days. In addition, transport of the produce over rough roads seemed not to be detrimental to the keeping quality of the roots, suggesting that the technology could be effective for commercial operations. Some modern methods, such as refrigeration, deep freezing, waxing, controlled atmosphere and chemical treatments, have been suggested for the storage of fresh cassava. Freezing and waxing have been used primarily for export markets in Europe and America, where the customers of African and Latin American origin are prepared to pay high prices. These techniques require specialized equipment and skills and are very capital intensive. When the yam reaches maturity, frequently at the beginning of the dry season, vegetative growth stops, the leaves turn yellow and most of the dry matter of the yam vine is translocated into the tuber which then enters a resting or dormant stage. This stage of physiological maturity normally takes place some 8 to 11 months after planting and the yams are then ready for harvesting. Traditionally yams are harvested manually using wooden spades or digging sticks and with great care to avoid damaging the tubers. Exceptionally, the short-term variety D. rotundata can be double-harvested, the first harvest being 5-6 months after planting and the second 3-4 months later (Onwueme 1978). During the first harvest great care is taken to remove the tuber or tubers by cutting below the head and leaving the top to grow again and produce a further tuber. · protection from direct sunlight and rain. Even when all these requirements have been met the dominant factor in determining how long the tuber can be stored will be the length of the natural dormancy period. By tradition and upbringing yam farmers understand that only sound, healthy tubers are suitable for storage. For this reason yams are harvested with great care but, because of the varying sizes and shapes of yam tubers, some damage inevitably occurs. Farmers are known to reject unhealthy or damaged tubers which are then used for immediate consumption or processing. A bruise or abrasion is more likely to lead to decay in storage than a clean cut and it is traditional practice to cut away any bruised or decayed flesh and often to rub the clean wound with alkaline material such as lime or wood ash to discourage reinfection. · Above ground. Yams are carefully piled on the ground and covered by a layer of grass at least 15 cm thick and finally a canvas tarpaulin or jute bags are used to cover the whole pile (Figure 4.1). Plastic sheets should not be used and the curing pile should not be exposed to direct sunlight. The cover should be removed after 4 days (Knoth, 1993). · Pit-curing. This is a widely used system in parts of Nigeria. It consists of a pit, approximately 2.5 x 1.5 x 1 metre with the bottom lined with sawdust or dry grass. The yam tubers are placed on this lining and then covered with a thin layer of soil. The treatment takes about two weeks after which the tubers can be removed for storage. According to trials in Nigeria, yam tubers treated for two weeks by this method showed only 40% rotted tubers after 4 months of storage, compared to 100% of untreated tubers. This method may need further studies in order to define more precisely the parameters of the operation, particularly in considering the optimum duration of the curing period combined with an appropriate fungicide. Both of these curing methods are dependent on high temperature and high relative humidity. Because these conditions also favour the development of fungi and bacteria. it is advised (Demeaux and Vivier 1984) that prior to curing the tubers should be treated with lime wash or wood ash, or if available, an appropriate fungicide such as thiabendazole or benomyl. After curing the tubers should be handled with care to avoid new injuries. A number of storage methods are used by farmers in West Africa. A simple method mixes the tubers with wood ash, heaping them and covering them with soil, possibly topped with dry grass as a form of mulch. Even more simply they may be stored on the floor or on shelves in shed or huts sometimes built for the purpose. The commonest type of yam store in West Africa is the yam barn (Figure 4.2). The barn is built on open ground but is usually, at least partially, shaded. There are many variations in the type of structure but basically it consists of walls of vertical timbers, each 5-10 cm in diameter, 2 to 3 metres high and set about one meter apart. The vertical timbers are often made of sawn trees which, if left unbarked, will take root when set in the ground (Bencini 1991, Ezeike 1995). It is considered this will reduce the risk of attack by termite or rotting of the timber at ground level. (The grown timbers will also help to provide shade.) In between the vertical timber are cross members of lighter section timber, bamboo or similar material. The barns are covered with a straw roof and enclosed within a fence or a wall for security. Inside the barn the tubers may be tied individually to the vertical timbers or otherwise arranged to allow maximum air circulation. The maximum storage life of yams in the barn is six months. Losses are reported to be 10% to 15% during the first three months and up to 30% to 50% after six months. Maize cribs or small thatched shelters, usually one metre high and built under the shade of large trees, are used in Côte d'Ivoire. The tubers are stacked up to the top of the hut, but only varieties with hard corky skins that are not easily bruised are stored in this way. In Ghana, and also in Côte d'Ivoire, yams are stored in pits. The earth which is excavated in making the pit is placed to form a low wall around the edge. This method is mainly for the storage of early-crop yams intended to be kept for limited periods only so that the ventilation requirement is less critical. Although the traditional storage in yam barns is very popular in West Africa the yams are vulnerable to attack by rodents and other mammals and it is very tedious to have to tie each tuber individually to the framework. This also can restrict ventilation and accentuate any tendency to deterioration. Any Improvement to the traditional structure attempts to overcome these deficiencies as well as improve weatherproofing and in exposed situations to provide better shading. Some farmers in Nigeria and Côte d'Ivoire often construct stores to meet the particular requirements of Dioscorea alata which has a long dormancy and other stores for different cultivars of the D. rotundata/cayenensis complex which have a shorter dormancies. These systems appear to work well with yams with a normal period of dormancy. 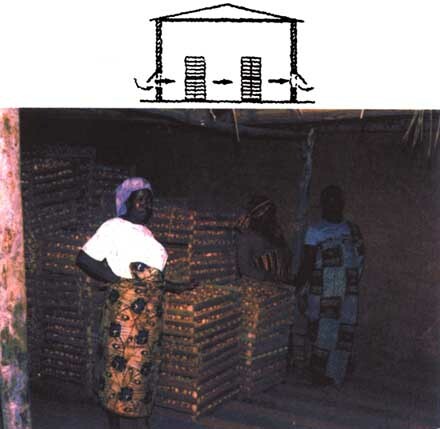 The Nigerian Stored Products Research Institute (NISPRI) recommends a structure similar to the traditional yam barn except that the yam tubers are placed in single layers on shelves instead of being tied to the framework (Figure 4.4). This is a quick, simple operation which allows the yams to be handled more carefully so avoiding the tedium of tying the tubers to the framework and the damage which is associated with it. Shelving also simplifies regular inspection and the removal of rotting tubers. The recommendations also include that a well ventilated shed be constructed over the shelves to give adequate protection from rain and sunlight. Protection against rodents can be achieved by fixing a barrier of sheet metal sheet or a wall about one metre high around the barn (Figure 4.4). Management of the store requires a weekly inspection, the disposal of rotting tubers and the removal of any sprouts on the tubers. Dipping of tubers in a solution fungicide, such as Benalate, Thiabendazole or Captan is recommended or the control of rot. (NSPRI, 1982). A development by an FAO post-harvest project in Benin comprising a wooden shed with an elevated floor fitted with rat-guards and covered by a thatched roof (Figure 4.5). Except for the sheet of galvanised steel and the nails used to make the rat-guards, all the construction material was readily available locally. The store has a capacity of approximate two tons of fresh yams. Trials in the central region of Benin compared the traditional method2 against the elevated store-shed using the early local variety Kpounan/Laboko. Over a storage period of 120 days losses were 38.4% by the traditional method against 22.4% in the elevated shed (Fiagan 1995). The tubers stored inside the elevated shed were treated with a mixture of fungicides and insecticides (5% thiabendazole, 2% malathion and 1.5% permethrin). The cost of the chemical was about 95% of the total storage costs of the elevated-shed store structure and chemical treatment, but its significance in reducing the losses was not evaluated. The Department of Agricultural Engineering of the University of Nigeria at Nsukka has designed a ventilated pit store for the storage of fresh yams (Figure 4.6). The pit is 2.9 m long, 1.3 m wide and 1.5 m deep, with a capacity about 200 tubers placed on wooden shelves. It is covered by a cupola shaped galvanised sheet metal roof which protects it from sun and rain (Ezeike 1995). To ensure adequate ventilation across the top of the crop, wire mesh was fitted on top of each long side wall up to the roof eaves on either side of the access door. An entry staircase leading down to the access door had a slopping corrugated aluminium roof which had to be removed to enter the pit. Vertical airflow within the store encouraged by fitting in the centre of the roof structure a chimney 18cm diameter and 1.7m high which was painted black to encourage convective air movement. This storage structure was evaluated over a period of six years, comparing it with the traditional yam barn. Temperatures in the pit remained constant over the range 21°C to 24°C. The barn and the ambient temperature were similar to each other but were consistently much higher than that in the pit. The humidity in the yam barn followed that of the ambient air and was quite low during the storage period. The mean weekly relative humidity of the pit was consistently high and ranged from 83.9% to 93%. The comparatively favourable temperatures and relative humidities within the ventilated pit contributed to a significant reduction of storage losses (Table 4.1). There is no indication to what extent this higher level of storage technology has been adopted by farmers or traders in Nigeria nor any indication of the overall costs of storage. 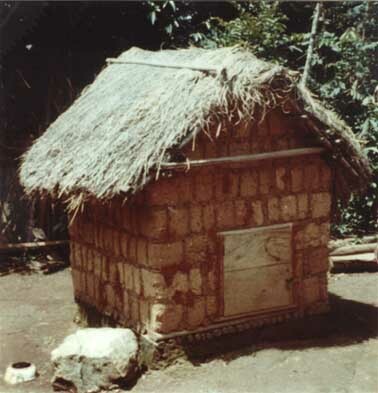 A storage structure similar to the Nigerian ventilated pit but with a thatched roof (Figure 4.7) has been tested in Benin. The results indicate that with the early variety kpounan the weight loss in the traditional system (tubers heaped inside a shed) could be reduced in the thatched-roof pit by 65% if yams were treated with a mixture of fungicides and insecticides (Fiagan, 1995). More efficient storage methods are essential if large quantities of yams are to be collected at regional centres. Refrigerated storage at about 15°C in combination with the use of fungicides has been successful. The widespread use of cold storage of yams is not yet feasible because of the high capital cost and the need for a technical support structure. Gamma radiation to inhibit sprouting has also been successfully used to reduce weight losses and prevent sprouting of the tubers for up to 8 months (Adesuyi, 1982; Demeaux, Babcaugh and Vivier, 1982). Temperature and tuber damage are the two most important factors in successful potato storage. Very careful handling is the key to preventing damage. Harvesting is best done when the soil is slightly moist to prevent abrasion and the tubers lifted carefully to avoid damage. Ideally they should be left to dry for few hours in the field, collected in field containers and placed in a cool, shady place. Potatoes for food (ware potatoes) must not be exposed to light for more than a few hours otherwise they turn green, develop an unpleasant taste and may become toxic (see section 1.4.4.2). It is important to make the distinction between ware potato storage and seed potato storage. The objective of ware potato storage main is to obtain the maximum quantity of tubers, of acceptable quality to the consumers, at a rate to meet consumer demand. This requires the lowest possible quantitative and qualitative losses, with no or little sprouting, kept in the dark to prevent greening and firm tubers, all at an economical cost. In seed potatoes storage the objective is to have optimum development of sprouts prior to planting. In both cases the farmer requires the maximum return from his investment in time, materials, equipment and buildings. Temperature influences the rate of respiration of the tubers, sprout growth and the development of microorganisms causing rotting (see sections 2.2 and 2.2.3). Figure 4.8 indicates in simple way the relationship between storage temperature and biological activity, For example, at a storage temperature of 10°C, the rates of sprouting, rotting and respiration are modest, at 20°C these activities are almost at a maximum. · the potatoes are not wet as a result of rain or condensation. At farmer level the curing method proposed for yams in section 4.2.1 is quite satisfactory for potatoes. If a sprout inhibitor is to be used, it should be applied after the curing operation has been completed otherwise curing will not take place. Sprout inhibitor should neither be applied to, nor come into contact with, potatoes to be used as seed. Simple low-cost storage of ware potatoes is possible in a wide range of structures and conditions provided that the basic principles of store design, operation and management are followed. In the highland tropics ambient temperatures of 10°C to 15°C at night and 15°C to 18°C during the day make it possible to use very simple methods of potato storage. In the lowlands of Sub-Sahelian Africa where potato growing has only recently been introduced there has been no general development and significant adoption of satisfactory storage systems, although work in this field is still on-going. The clamp is a simple and inexpensive storage method particularly applicable to the more temperate regions of Europe and Latin America (Figure 4.9). The details of design vary considerably but all follow similar lines. CIP recommends (Centro International de Papa 1981) that tubers are heaped on a bed of straw 1m to 1.5m wide with a ventilating duct on the floor in the centre of the heap and covered with a layer of about 20 cm of compacted straw or 30 cm if not compacted. The clamp must be in a well-drained location. Temperatures inside a ventilated clamp will be approximately those of the ambient temperatures. The clamp system can be modified to meet local requirements provided nothing is done that will lead to an unwanted increase in temperature. To avoid too high a temperature in warm climates the clamp should be shallow, but the length can be increased if necessary to maintain capacity. Where rodents or other mammals are a nuisances a wire net can be dug at least 15 cm deep into the ground and covered over the clamp. There must be sufficient movement of cool air through a heap of potatoes to remove respiratory heat and keep the potatoes as cool as ambient temperatures will allow. The design of any naturally ventilated store is based on the principle of natural air convection. This type of store has been the subject of intensive extension programmes by FAO for farmers in the highlands areas of Cameroon and by CIP in Kenya. The critical factor in maintaining the store temperature as near ambient as possible is the size of the heap. Generally, the maximum height of the pile of potatoes should not exceed 1.2m. If, for any reason store temperatures are expected to be higher than 25°C, it is better to keep the potatoes in small lots, in small crates or in shallow layers. 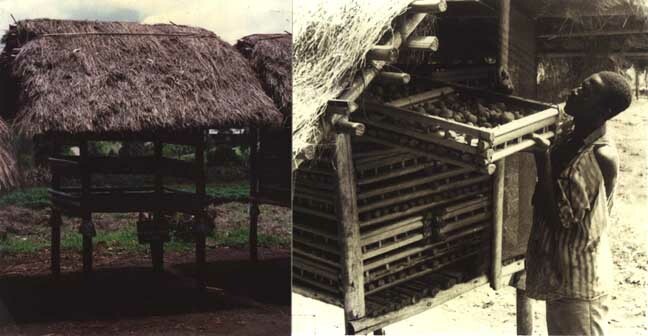 The Naturally Ventilated Store introduced by the FAO project was a mudblock structure, 1.2m long, 1.2m wide and 1.0m high to the eaves with a thatched roof and a capacity of about 700kg The capacity could be increased by making the store longer. (Figure 4.10). The lower part of the store was a ventilating chamber or plenum made over a pit about 35cm deep into which was built a stone foundation wall 15 cm deep to support a mud block wall on the periphery of the pit and rising to ground level. Wooden sticks (saplings or sawn timber) were spaced two or three centimetres apart and laid over the stone wall to make a ventilating floor. A mudblock wall was continued upwards for a further one metre to the eaves. On the windward side of the structure a ventilation opening was fitted with a shutter to control ventilation. The storage section was from the false floor up to eaves at one metre high and was provided with closeable openings for loading and emptying. The roof was a structure of raffia (or equivalent wood material) covered with grass. Store management was simple. After curing the potatoes are treated with a sprout inhibiter. During the storage period the shutter on the ventilation opening is left open at night when ambient temperatures are lowest (13°-18°C in Cameroon) and closed during the day when temperatures are higher and relative humidities lower. A series of trials, carried out both at research station and farmer level, compared the FAO store with prevailing storage methods. The results clearly indicated that the cool night air ventilation and reduced day time ventilation lead to a significant improvement in the condition of potatoes after storage over the existing traditional methods. Good quality potatoes could be stored for four months with losses of about 10%. The advantage of the improved store to farmers was that instead of being forced to sell all their crop within a maximum period of two months when market prices are at their lowest level, this new store allowed them to extend or delay the marketing of their potatoes until prices were more favourable. The construction of the store is limited for the most part to locally available materials, mud blocks, bamboo or wood poles, wooden shutters and few locally available carpentry items. The cost varies from 5,000 francs CFA, when all materials, excluding carpentry items, were available on the farm, to 18,000 francs CFA when the farmer pays for all the materials and labour. The cost/benefit ratio was estimated to be 2.5, on the basis of information provided by farmers who had adopted this technology. Thus a capital investment of 18,000 CFA could be recovered after two storage periods (Diop and Wanzie, 1995). The principle of naturally convected air ventilation was applied to the storage of potatoes in warehouses of 7-20 tonne capacity. The structures were built of mudblock walls with a galvanised corrugated sheet steel roof. Controllable ventilation louvres, each 70cm x 30cm, were built into the two long walls, those at the windward side were 50 cm above the ground, those on the opposite wall were built at about 30 cm below the eaves level. There was at least one pair of louvres (inlet and outlet) for every three linear metres of wall. A ceiling of bamboo or raffia was built under the roof on which was placed a 30 cm thick layer of packed straw to insulate the building from the heat radiated from the metal roof. Mudblocks were preferred to cement blocks because their insulation was greater. The ventilation louvres were opened only at night. The average internal store temperature was 14.5ºC with a mean minimum outside air temperature (at night) of 10ºC and a mean maximum outside air temperature of 30ºC (Toet, 1982). More than 50 stores of this type were operated by women organized into pre-cooperatives for the marketing of potatoes. The potatoes were placed inside small crates (50 x 30 x 30 cm) which were stacked in rows inside the store, leaving inspection alleys of 80 to 100 cm, wide. Each crate was marked with the name of its owner but marketing was organised as a group. The effect of light on reducing sprout elongation and the physiological ageing process has long been known. CIP and others have demonstrated how a store using natural diffused light can be used for storing seed potatoes by farmers in tropical countries. Only a simple shed protecting the potatoes against rain and direct sunlight, and equipped with shelves on which the potatoes are spread in shallow layers is needed (Figure 4.13). After few weeks of storage, seed tubers turn greenish and develop short, sturdy and green sprouts. Protection against rodents attacks may be necessary. · keeping the relative humidity as close as possible to 85%-90%. The storage structures recommended in section 4.3 for potatoes can also be used satisfactorily for sweet potatoes. Cocoyams store best in a cool, dry and well ventilated environment. The optimum storage temperature is reported to be 7°C, when corms of taro and tania can be stored for up to four months. At higher ambient temperatures (25° to 30°C), cocoyams will store only for periods of 4 to 6 weeks without serious losses. Traditional storage methods are simply heaping the corms or cormels under shade or covering them with straw or plantain leaves. Occasionally the heap is covered with wood ash which may have some fungicidal effect. Storage in pits is also carried out with the pits covered with leaves and soil. In the South Pacific, corms are often harvested with about 25cm of the basal petiole attached, tied into bundles and suspended in the shade for storage (Cooke et al. 1988a).